Week 8 was not a perfect week for the Washington Capitals, but it was a good week. A very good week. Arguably their best week of the season. Because as much as the how many, it was the how, and as much as the how, it was the who the wins were forged against. 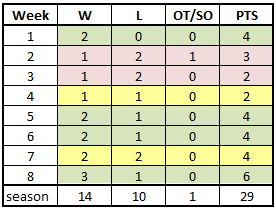 The Caps had their fifth straight non-losing week (over which they are 10-6-0) and their winningest week of the season with three victories. That they would have as successful a week as they did was surprising in the context of a season in which stringing together wins consistently has been a challenge. Coming into Week 8, the four teams that the Caps would face had a combined record of 48-22-8. When the Caps dropped their opener in the week to the Calgary Flames, 4-1, to end a five-game home winning streak, things looked bleak for a club hovering along the .500 mark for the season. But righting the ship in their other two home games – wins over the Ottawa Senators and Tampa Bay Lightning – gave them seven wins in their last eight contests at home, outscoring teams by a 24-15 margin. Beating the Toronto Maple Leafs on the road at Air Canada Centre ended a three-game road losing streak. It was a bit of an odd week in that it extended some patterns, good and bad. When the Caps lost to the Flames to open the week, it was Washington’s third loss in their last four games against the Flames on home ice (1-1-2). The win against Ottawa gave the Caps a 9-1-1 record against the Senators over their last 11 meetings overall. The win against Tampa extended the Caps’ record to 13-1-3 in their last 17 meetings overall against the Lightning and 22-2-2 in their last 26 meetings in Washington. The Caps have not lost consecutive games to Tampa Bay on home ice since the 2006-2007 season. And the win over Toronto to end the week brought the Caps’ record to 11-3-1 against the Maple Leafs in their last 15 meetings overall. Scoring three or more games to end the week does not sound particularly impressive, but it marked the first time that the Caps scored three or more goals in three consecutive games since Games 13-15, and it was only the third time this season that they cobbled together three straight games with three or more goals (they have not had a four-game streak). There was a significant personnel adjustment in Week 8, the pair of Nicklas Backstrom and Alex Ovechkin being reunited to open the second game of the week, that against the Senators. The move bore early dividends with Backstrom starting a play late in his own end that would be the secondary assist in a goal by Ovechkin with 5.0 seconds left in the first period to give the Caps a 2-0 lead on their way to a 5-2 win. Before the week was out, Backstrom assisted on four of the five goals scored by Ovechkin. Ovechkin led the team and finished second in the league for the week in goals with five (Vegas’ William Karlsson had six), while Jakub Vrana had three for the Caps. They were the multiple goal scorers in a week in which seven Caps shared in the goal scoring. Ovechkin had three of his goals in the 4-2 win over Toronto to end the week, taking over the franchise record for hat tricks with 20 (Peter Bondra had 19). The hat trick was his third of the season, tying his all-time best for a season, accomplished in two previous seasons (2007-2008 and 2008-2009). Those 20 career hat tricks are more than any NHL’er has posted since the 1994-1995 lockout (Bondra: 17). Fourteen different skaters recorded points, led by Ovechkin and T.J. Oshie with five apiece, all of Ovechkin’s coming on goals and all of Oshie’s on assists. Seven different Capitals had multiple-point games, Oshie being the only one who had a pair. The Caps set another team best on the defensive side of the ledger. In allowing only five goals over the last three games of the week, it marked the first time this season that Washington allowed opponents two or fewer goals in three consecutive games. Through 25 games last season the Caps had already accomplished the feat three times. A key was keeping shots on goal down. After allowing 39 shots in the 4-1 loss to Calgary, the Caps allowed Ottawa, Tampa Bay, and Toronto a total of just 86 shots (28.7 per game). Not that was a particularly good week in terms of shots against. Only the Anaheim Ducks allowed more shot attempts at 5-on-5 than did the Caps (287 to 199), and they did it in five games to four for the Caps. Their shot attempt differential at fives was fourth-worst in the league (minus-29), as was their shot attempts-for percentage (46.07; all numbers from NHL.com). Part of the result might have been due to score effects, the Caps over 50 percent in SAT%-close against Tampa Bay (53.57 percent) and Ottawa (54.29 percent), but using that to explain away a challenging week is a stretch. One might say that no one Capital or group of them was exploited in an unusual fashion (except perhaps Brooks Orpik, who was on ice for six of the nine goals scored against the Caps for the week), but on the other hand, 17 skaters being on ice for at least one goal against spoke to a kind of sharing about which one does not get excited. It was a good week overall. Even the opening goal of the week was not quite awful, Braden Holtby having to face 39 shots, allowing four goals. Holtby was better after that in facing a bit lighter workload, stopping 56 of 59 shots (.949 save percentage) in his last two appearances of the week. Those appearances bookended an appearance by Philipp Grubauer, who got the rare front end of a back-to-back set of games, and at home to boot. 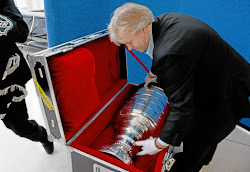 It might have seemed a bit of a sacrificial offering, given that Grubauer, who had yet to win a game this season, would be going against the team with the best record in the league in the Tampa Bay Lightning. And when the Lightning scored just 82 seconds into the game, it looked as if Grubauer’s troubles would continue. However, Grubauer stopped the last 23 shots he faced, and the Caps rallied to a 3-1 win to give him his first win of the season. It was something of an average week for the Caps, although it was the third consecutive week of 20 percent or better in power play efficiency after a pair of weeks drawing blanks. If there was a down side to finishing at 20 percent, it was having that efficiency achieved as a result of only ten opportunities in four games. In that sense it was an odd week. Even with the Caps enjoying only seven power play chances in three home games for the week, their 46 power play opportunities on home ice ended the week tied for eighth-most in the league. That they were just one for seven in those chances was not unusual in the context of this season, the Caps’ 15.2 percent efficiency on home ice ending the week 24th in the league. The Caps did not lack for shooting effort on their infrequent power plays. 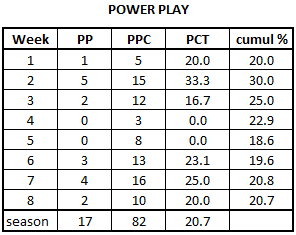 In 16:56 of power play time for the week, they recorded 20 shots on goal. Even in just 48 seconds of power play time on their lone power play against Ottawa, one that ended in one of the two goals, they had three shots on goal. Alex Ovechkin did not have one of those three shots on goal against the Senators, but he did have nine of the 20 shots for the week to lead the club. It was another week in which if the Caps were not perfect, they were not good. Twice in eight weeks the Caps have been perfect in killing penalties. In the other six weeks, including Week 8, the Caps did not reach the 80 percent kill level. On another level, though, it was not such a bad week. Three of the teams the Caps faced – Tampa Bay (1st), Toronto (10th), and Calgary (11th) finished the week among the top dozen teams in the league on the power play. They were burned as much by opportunities allowed against the Flames (five) as any technical shortcomings. The flip side of that is that the Caps held the last three opponents for the week to a total of just seven power play chances and held the Maple Leafs to a single chance on their ice. The Caps might have been better in allowing shots, but given the quality of power plays faced it was not a bad week. In 19:53 of shorthanded ice time, the Capitals allowed three goals on 21 shots, and it was only against Calgary, against whom the Caps skated 8:42 shorthanded, that they allowed more than a shot per minute (11, on which two goals were scored). 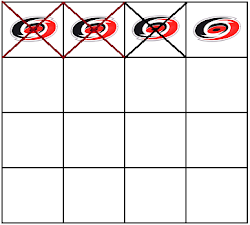 Overall, it was a good week for the Caps in the circle, not so much in the particulars. Winning the offensive (55.0 percent) and defensive ends (56.9 percent) by wide margins and the week overall (53.9 percent) were positive developments, but the entire week boils down to an uncommonly dominant effort against the Tampa Bay Lightning. In that 3-1 win over the Lightning, the Caps were 40-for-18 on draws (69.0 percent). For the other three games they were just 85-for-174 (48.9 percent). It was similar by zone, the Caps winning 11 of 15 in the offensive zone against Tampa Bay, but going just 22-for-45 in the other three games. In the defensive end it was 18-for-23 against the Lightning, but just 36-for-72 in the other three contests. Individually, Jay Beagle had the best week, finishing 31-for-49 (63.3 percent). He was all but unbeatable in the defensive end against Tampa Bay, finishing the game 12-for-13. The defensive end was an odd place for Beagle in Week 8, alternating games with a 50-plus win percentage (against Calgary and Tampa Bay) with less than 50 percent games (against Ottawa and Toronto). Among the other Caps with at least ten draws taken, Nicklas Backstrom (51.4 percent), Lars Eller (56.0 percent), and T.J. Oshie (57.1 percent) finished over 50 percent, while Evgeny Kuznetsov (43.6 percent) was underwater for the week. It was a week in which the Caps generally started well in games but finished sluggishly. Washington scored first period goals in all four games and scored first in three of them. 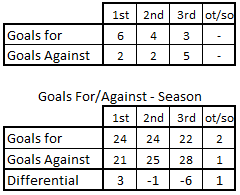 They posted multiple-goal totals in two of the games, both of which ended in wins (Ottawa and Toronto). At the other end, the Caps allowed five third period goals for the week, those coming over the course of three of the four games, two of them breaking a game open in favor of the Flames to open the week and another pair coming in the Toronto game to end the week that made what was a 3-0 game a lot more interesting than perhaps it should have been. 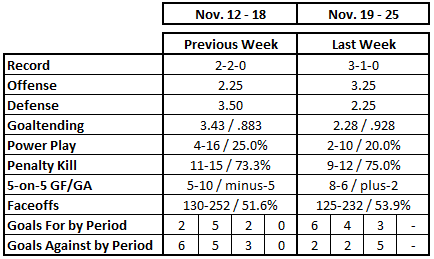 The goal differential of minus-2 in the third periods of games in Week 8 might make things look better than they were. All three third period goals scored by the Caps were of the empty net variety – Alex Chiasson against Ottawa, Jay Beagle against Tampa Bay, and Alex Ovechkin getting the hat trick against Toronto. The Caps finished Week 8 with a three-win week on a schedule that featured three teams eligible for the postseason at week’s end, wins over Tampa Bay and Toronto and a loss to Calgary. That they swept all three games in a three-games-in-four-nights stretch, interrupted by the Thanksgiving holiday, says something about the team’s focus this week. Finishing the week as the first wild card team in the Eastern Conference is a good thing, made better because while they hold a three-point lead over the New York Rangers and a five-point lead over the Boston Bruins – the teams just under the playoff cutoff line – the Rangers hold two games in hand on the Caps, while the Bruins hold four games in hand. Still, it was a very good week for the Caps, a nice holiday present for their fans and for one fan in particular, a week for which we might offer some thanks as the Caps get a few days off before starting a five-game home stand this Thursday against the Los Angeles Kings.